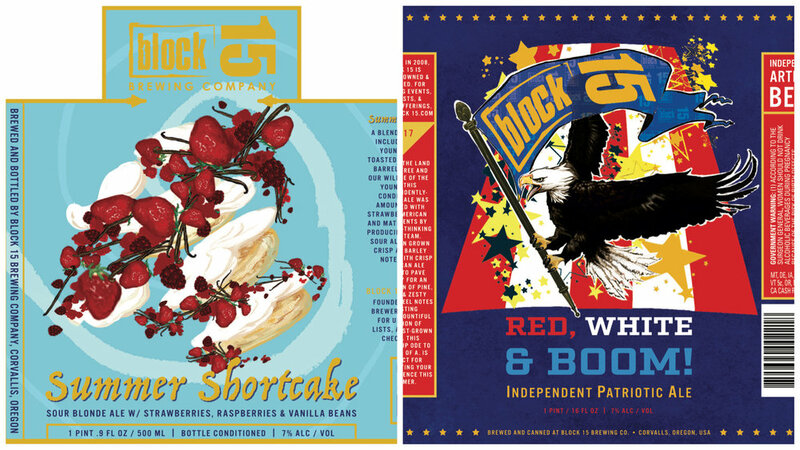 Join us at our south Corvallis Brewery & Tap Room on Saturday, July 1, for the release of two packaged beers—Red, White & BOOM! and Summer Shortcake. Both release beers will be available to purchase when the Tap Room doors open at 11:30am. Born in the land of the free and the home of the IPA, this independently-brewed ale was crafted with 100% American ingredients by our free-thinking brew team. American grown malted barley blends with crisp American Ale yeast to pave the way for an explosion of pine, mango & zesty orange peel notes bursting from a bountiful addition of Northwest-grown hops. This hopped-up ode to our U.S. of A. is perfect for celebrating your independence this Summer. A blend of sour blonde ales, including a tart and zippy young beer brewed with toasted oats alongside rustic barrel-matured stock from our wild cellar. This blend of young and old was then conditioned on generous amounts of Oregon-grown strawberries and raspberries and matured on vanilla beans, producing a fruity, refreshing sour ale that finishes with a crisp acidity and lingering notes of freshly-picked berries.